Based off of substantial research – those look like funny cars! / green / mountains / Google: “towns in Iceland near mountains” – I believe this is Seyðisfjörður, Iceland. I don’t actually think I’m right, but Seyðisfjörður is probably the coolest name of a town ever. I’m not sure if it’s an educated guess or a wishful thinking to get away from the snow and cold of a Michigan winter, but either way, I feel like it’s a street I have driven down in Cancun. Or maybe I’m just wishing I could. Or maybe this charming locale? New Zealand. I’ve read the Dish for year and this is my first time writing in. I gasped when I saw this week’s VFYW. I travelled around North and South Island for six weeks this past summer and I miss it terribly. It’s an incredible country. The trip marked my first time backpacking and that that green encircled “i” was a constant source of help. It is a sign for an i-SITE, NZ’s immensely helpful network of information centers that even the smallest towns seem to have. After five minutes of searching I decided to give up- looking for pictures of all the notable mountains would take forever… Oh the NZ mountains! The construction techniques, vehicles, and topography all look like the Andes to me, and are particularly reminiscent of Cajas National Park, so let’s go with Cuenca, Ecuador. Could it be we’ve gone literally to the end of the earth this week? 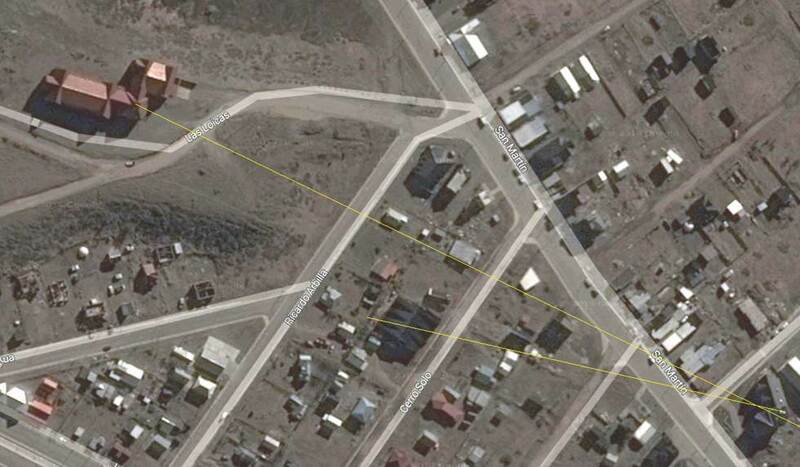 I’ve been Google-wandering Latin America today, and Ushuaia, Argentina is where I’ve landed. The mountains are tall, jagged and young, and the terrain is green in January: it’s either near the equator or somewhere in the Southern Hemisphere. Too mountainous and too snowy to be Hawaiian volcanos. The cars are left-hand drive, so it’s not New Zealand. License plates are shaped like North American plates, unlike Chile’s, Peru’s or Brazil’s. They’re light-colored with what seems to be a horizontal black streak: Argentina. So—Patagonia? And pretty far south: last exit before Antarctica, in fact. Google Street View seems to confirm matching architecture (vibrant colors on walls and peaked roofs) and sidewalks. I can’t get quite to the right street today…but for kicks, I’m going to guess I’m somewhere near the corner of Neuquén and Islas del Atlántico Sur. Unless I’m on the wrong continent. Either way, Ushuaia looks amazing, and I’ve now discovered a new town to put at the very top of my wish list. Thanks, as always, for this challenge. A view where I’m not on wild goose chases researching page after page of minarets. I think, being from Minnesota, I’m better at finding cold places than warm. I can sniff out Nunavut or Halifax no problem, but Dakar or Turkey leaves me bewildered. This week is no different. This week’s view shouted high Andes at me. Don’t know why, never been there. A really good hunch. This looked like the kind of place that outdoor adventure seekers would flock to, as evidenced by the mountain bike leaning on the building in the foreground. 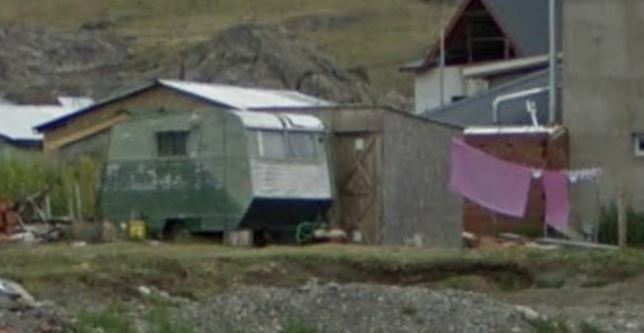 A Google search for “Andes mountain hostel” led in short order El Chalten, Argentina. 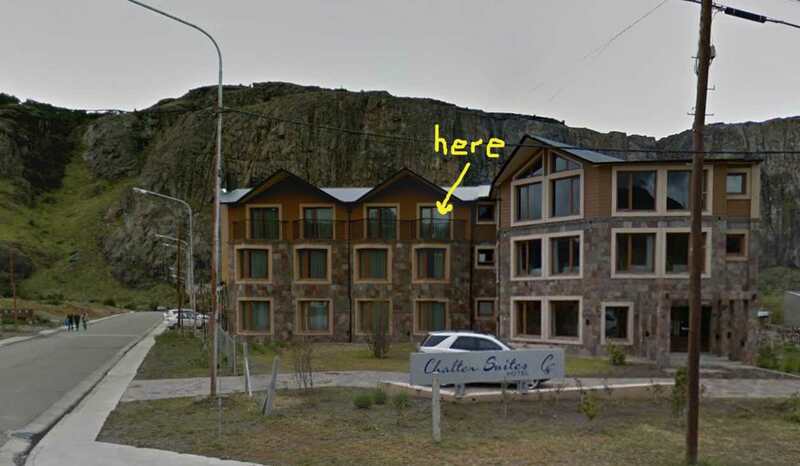 With the aid of Street View and I found our hotel, The Chalten Suites Hotel. Those mountains! If you told me that was a painted background I’d believe you. Okay, I’m new to the contest. But I narrowed this one down to four windows. I couldn’t read any of the signs, but I could see that they were written in the roman alphabet. And it was probably a language in which “i” stands for information. First, I ruled out countries that drive on the left side, so it couldn’t be New Zealand or South Africa. Next, I ruled out real northern mountains (Canada, Alaska, Norway), because of the lack of evergreen trees, and the lack of snow. Right now, it’s winter here in the Northern Hemisphere. A place at this altitude would be covered in snow and ice. So I figured it was South America. My first hunch was Chile. So I started looking at Chilean license plates, but they didn’t look right. The license plate in the picture looks like it has a black spot in the middle. I googled photos of traffic in Argentina. Cars in the distance, ones whose plates are too far to read, appear to have a black spot in the middle (because the plates are black with white letters, and there’s a large black space between the letters on the left, and the numbers on the right). 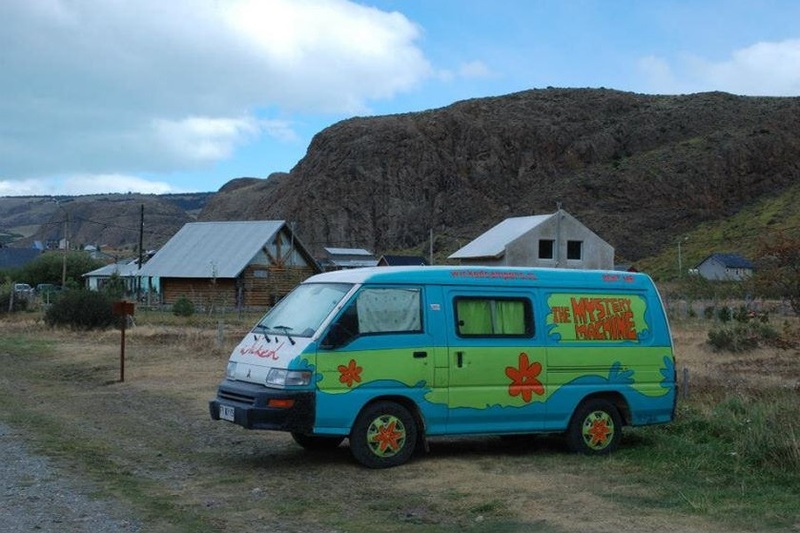 So I googled Patagonian mountain town images. 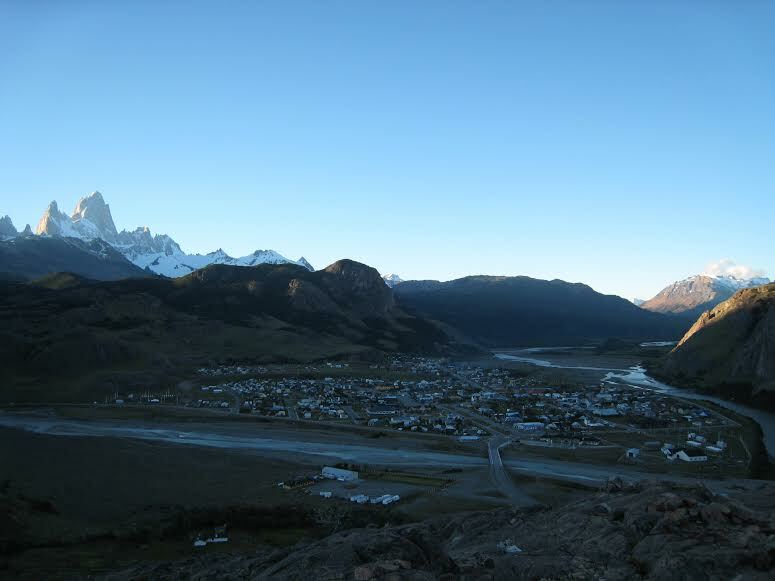 One of the first towns I found was El Chaltén. Everything looked right: the snowcapped mountain, the greenery, the architecture. I confirmed it when I kept seeing photos of the building with the huge red roof (in the top right corner of the VFYW photo). 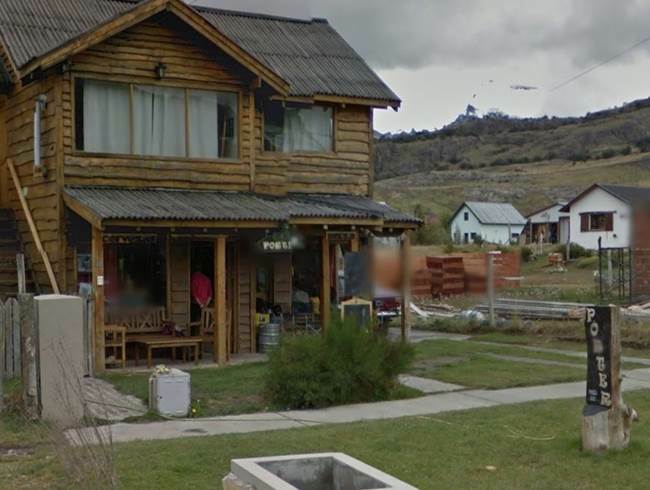 In the view, there’s a sign that sticks up over the larger yellow building that looked like it said “coffee.” So I googled “El Chaltén Coffee Shops,” and found a guy’s Twitter photo of him sitting in a hammock outside of Mathilda, a coffee shop, in El Chaltén. Mathilda is the yellow building next to the information center. You can see the information center in his photo, and I knew I was there. It was scintillating stuff. Then I used Google’s satellite map, found the roofs I was looking for – it’s not a large town – and used Street View (lucky) to put myself on that corner. 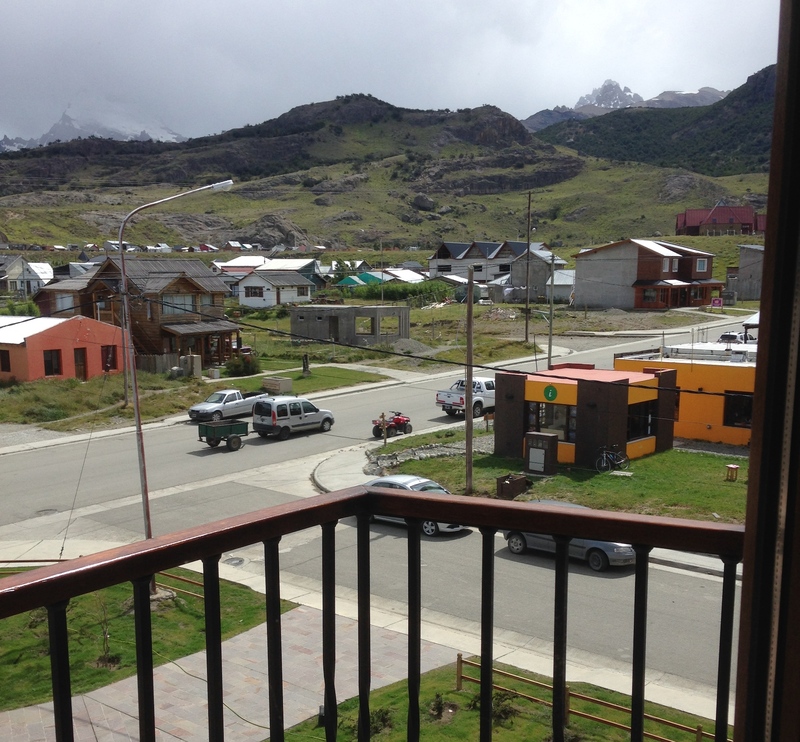 I was staring at El Chaltén Suites Hotel. There are four rooms with balconies like the one in the photo. I tried to do some kind of geometric voodoo to figure out which one it was. I think it’s one of the two closer to the center of the building. I’ll go with the furthest right of the balconied windows. Argentina founded the village of El Chaltén in 1985 to solidify its sovereignty in the area amid a continuing border dispute with Chile over this part of Patagonia and the Southern Patagonian Ice Field to the west. Although Chile and Argentina made progress in defining their border in the 1990’s, tensions rose over the undefined border in 2009 when Néstor Kirchner’s government unilaterally issued maps displaying Argentina’s claims. BTW, the donuts at the nearby Panaderia Que Rika look amazing. It’s proximity to Los Glaciares National Park as well as the Cerro Torre and Cerro Fitz Roy mountains explain why it’s known as the region’s “capital of trekking”. The town operates primarily as a tourist destination for climbers, hikers and adventures. Your reader must have sent you the photo after they returned to a more travelled location. The cell phone service is so poor that it warranted mentioning on Wikipedia’s entry for the town. How are you supposed to Instagram your morning hike if you can’t get a signal? Another Dish contest, another new destination on my “I want to go to there” list. Thanks! 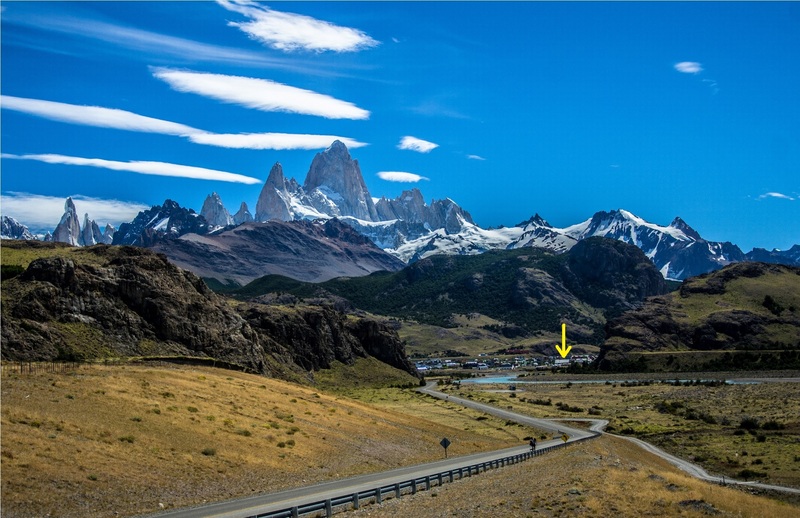 I’m a Dish reader, so of course I have visited Torre del Paine, but only from the Chilean side, by bicycle, many years ago now. You only have to do this contest a few times to scoff at the TV shows and movies where the intelligence agencies zoom in on a tiny area of a low-res photo, hit the mysterious “enhance” button that I can’t seem to find on my keyboard, and voila: the image resolves to show paint flecks on a license plate. Chumps. Oh my God! Oh my God! Oh my God! I know this one!!! I’ve been there! My personal rule when I play VFYW is that if I don’t have a gut reaction or an intuition when I first see the picture, I don’t play (but I still check in on Tuesday to find out where the picture was taken.) But when I saw this picture this morning it reminded me of Patagonia, and I felt I had been on this street before. In 2011 my partner and I went on a hiking trip there as a reward for losing weight and getting in shape. It looked to me like the VFYW was taken in one of the small towns we stayed in on this trip. 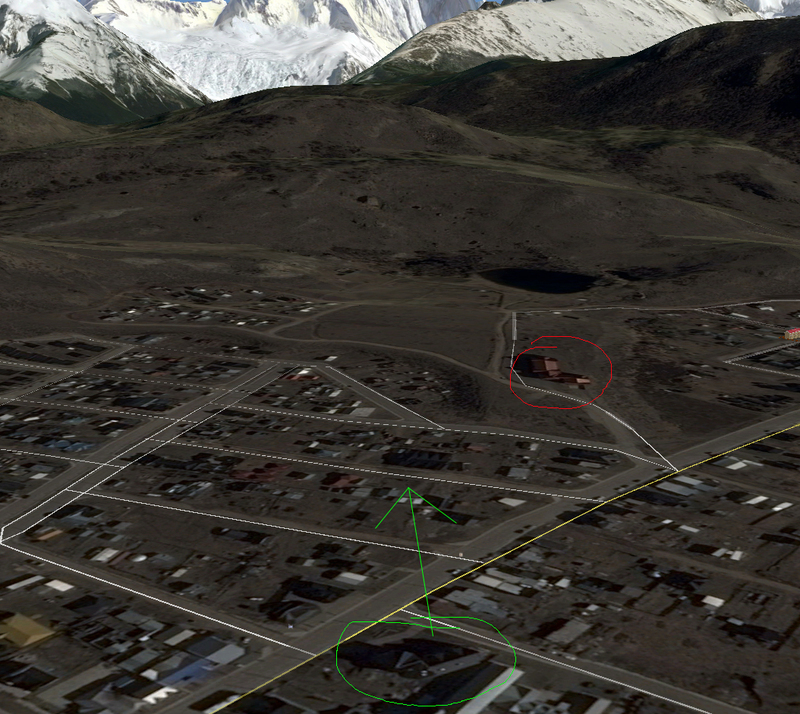 But one of the towns that was on the edge of the Andes. 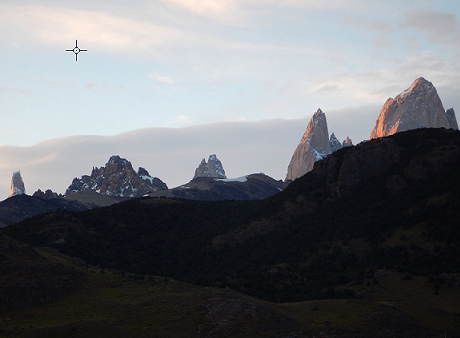 A quick review of our photos from the trip brought me to El Chalten! We stayed a few nights in El Chalten so we could go hiking around Monte Fitz Roy and Cerro Torre in Parque Nacional Los Glaciares. Turns out even in a windswept town this small and remote, Google street view has driven around a few of the main streets. So I went for a “drive” starting from the west edge of town on San Martin and found where this picture was taken! 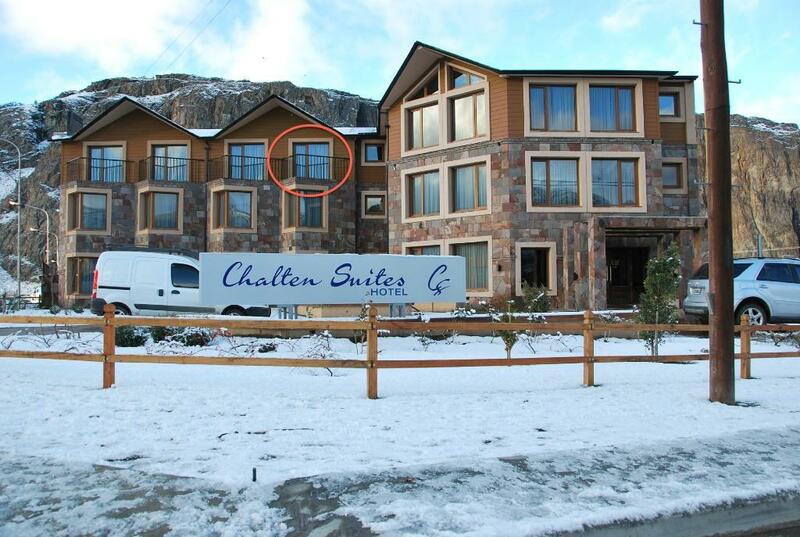 Because of the railing in the bottom of the picture, it appears to have been taken from a third floor balcony of a room at the Chalten Suites Hotel. Judging by the angle of the shot I think it is probably from the third or fourth room in from the corner of the building on Trevisan Street. The weather was always overcast when I was there. In fact, it rained and/or snowed all seven days. On the final day there was heavy snow, and I had been putting off the main hike to get a view of Fitz Roy and the three lakes in the area. I was bummed that I wouldn’t be able to do it, but at noon I said “screw it” and hiked in the snow. I hustled because it was late, and was falling all over the place, slipping and sliding up the mountain. I was the only one on the trail. When I got near the top the snow stopped and the clouds parted, revealing perfect views of the three lakes. It was an amazing day. I’ve been reading The Dish ever since I moved as an Australian expat to Peru in January 2008, just in time to follow your coverage of President Obama’s campaign and win minute-by-minute from my tiny flat in Lima. In all that time I’ve never even got the country right in the View From Your Window Contest. But I know exactly where this one is. Argentina is close to my heart. I worked as a tour guide and travel book writer in South America for two years, and visited El Chalten twice, once while writing Patagonia chapters for that rapidly shrinking field of publishing. The other time I was travelling with my geography-teaching girlfriend where I spurned a golden chance to pop the question at a waterfall off the Fitzroy Glacier not far from where this picture was taken. Could there be a better spot to ask a geographer to marry you? Turns out there was. I found my bravery in the stunning high-altitude desert city of Mendoza a month later (my wife is also a sucker for great urban planning) and we now have two beautiful girls who have never seen mountains or snow. We live in Darwin in the Northern Territory, about the furthest point on the planet you can get from Argentinian Patagonia without crossing the Equator. Oh man, I simply got lucky on this one. I almost gave up, but I really hate losing so I had to try one last time. And while making one last-ditch Google search for “school with red roof and skylight”, I ran across a travel page with a picture of the Los Cerros Hotel on it. Not a school after all. Before that, I had been looking around the Grand Tetons and western Colorado. I mean, what could be more American than an old travel trailer sitting up on blocks in your back yard? Then there is “Porter”. The sign across the street both in front of and on the rustic log building. I was wishing I had that “zoom in and enhance” feature from Bladerunner. Would have saved me a lot of time. It’s “guide” in the US. Looks like this one to me. Hotel looks a lot nicer completed too. Thanks for the challenge. I’ve come to really look forward to this game. I was surprised to find that I was more excited to have my picture selected than I was when I had my one contest win a year ago. Now I have to find a new goal! And if Chini is in form, perhaps he guessed that it was taken at 3:30 pm on December 29 (though don’t ask me the heading). Love the VFYW contest and the Dish – keep up the great work! An appropriate poem for a small milestone I’ve been closing in on. But to get there, I had to summit one final climb and find this week’s view. A climb that began in…Canada. My first guess was Canada. AGAIN. Seriously subconscious, you need help. So yeah, when that didn’t work, I ran off to Wyoming, again. Which also didn’t work, because, Wyoming? On and on it went like that, fruitless step after fruitless step. In the end, the secret lay with…Djupivogur, Iceland? Well, whatever works baby, whatever works. Oh, and as for the milestone? Well, let’s just say when it comes to Van Halen, I went one louder.